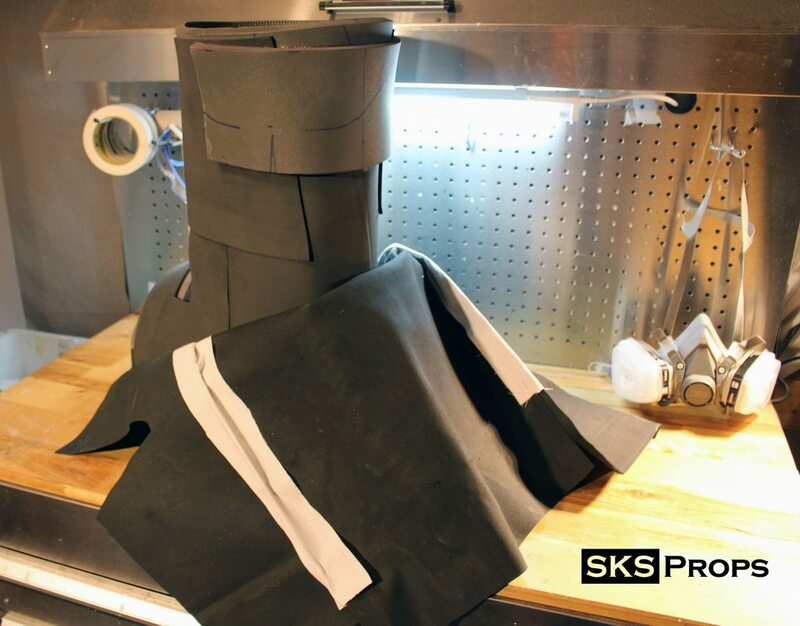 Discussion in 'Replica Costumes' started by SKS Props, Dec 10, 2015. Here is my big project for the beginning of 2016. 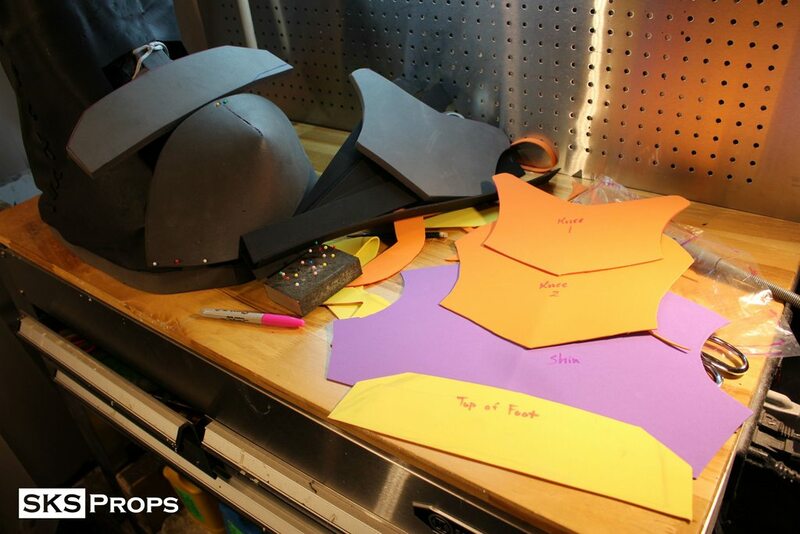 I will be constructing a full scale Orc from the World of Warcraft! I have wanted to build a badass orc for a couple of years now and I figured that this would be the best time to jump in. I started planning the scale and logistics of this build back in May. But because of conventions and orders I have only been able to work on it for a few hours here and there. I decided that I didn't want to make a specific Orc from the series but a version that is based off of the original concepts. That entails green skin, red armor, tons of spikes, and a nasty attitude! Jeebs 23, Battata, n0regret5 and 5 others like this. For my Warcraft Orc I started from the ground up. I figured that if I couldn't stand and walk around ok the rest of the costume wouldn't matter how good it looked. I drew an orc on my wall so I could get a feel for the scale I was wanting. 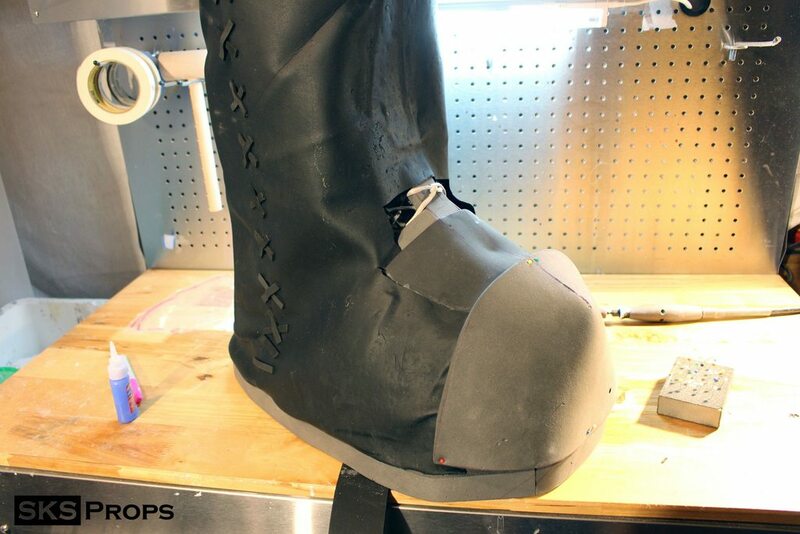 I will upload all of the progress pics of the boot construction over the next couple of weeks but here is a basic shot of the risers and under structure. 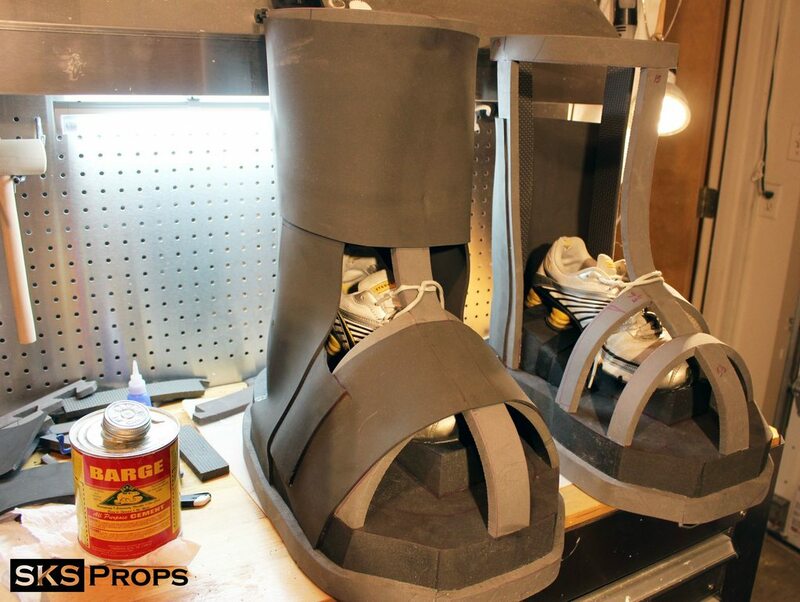 The boots are an all foam construction. Which makes them extremely light and comfortable. 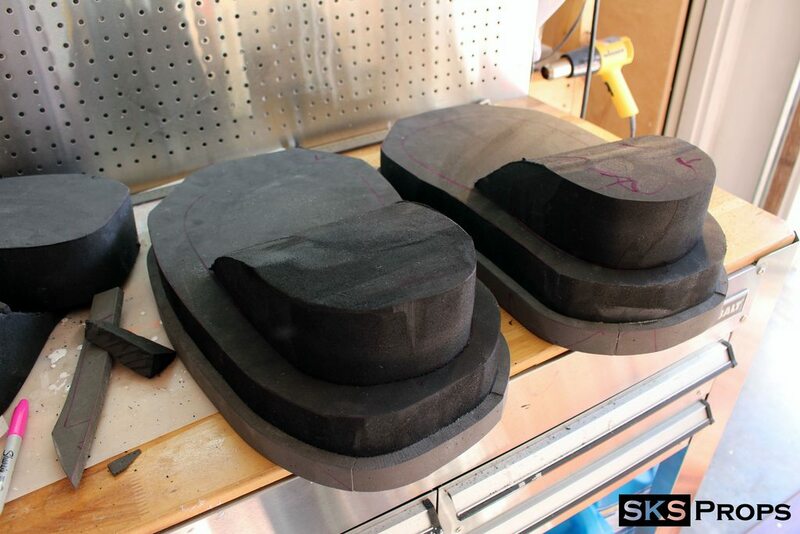 I am lucky enough to have a foam supplier near by that offers scrap chunks of 3" foam that I used as the base and the heel. 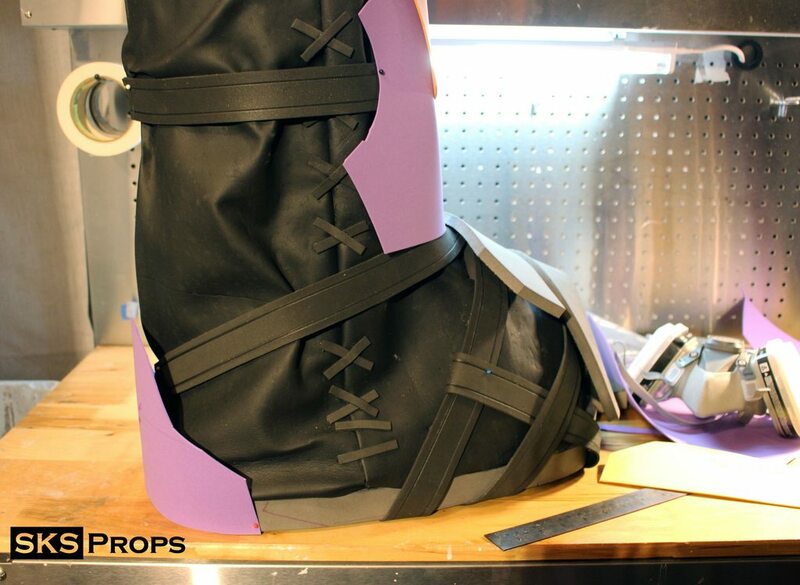 Regular 1/2' eva use cut to make the support structure of the boot. All of this will be skinned...you can really get the scale of the boots when you notice my shoes inside. Burnfactor, n0regret5, Poot Poster and 2 others like this. Cool. 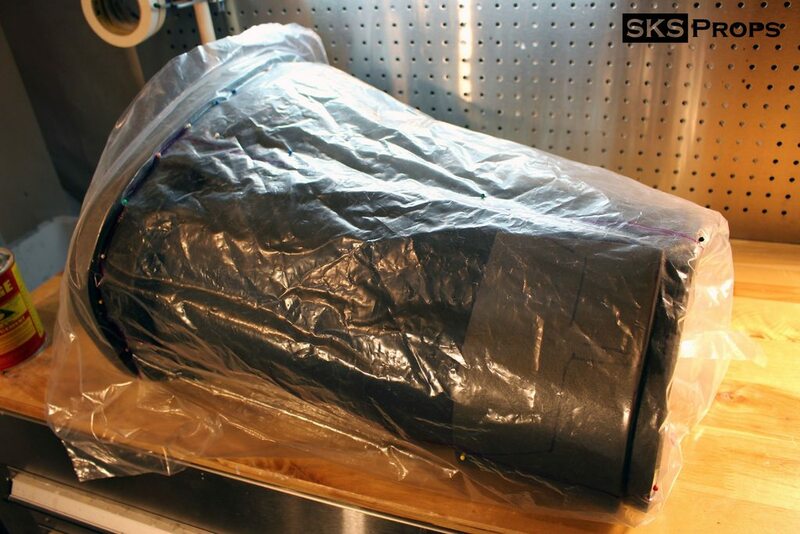 Can't wait to see how it turns out. This sure beats my "Macho Man" costume idea for 2016.
n0regret5, paskadi and SKS Props like this. SKS Props and B Wo like this. 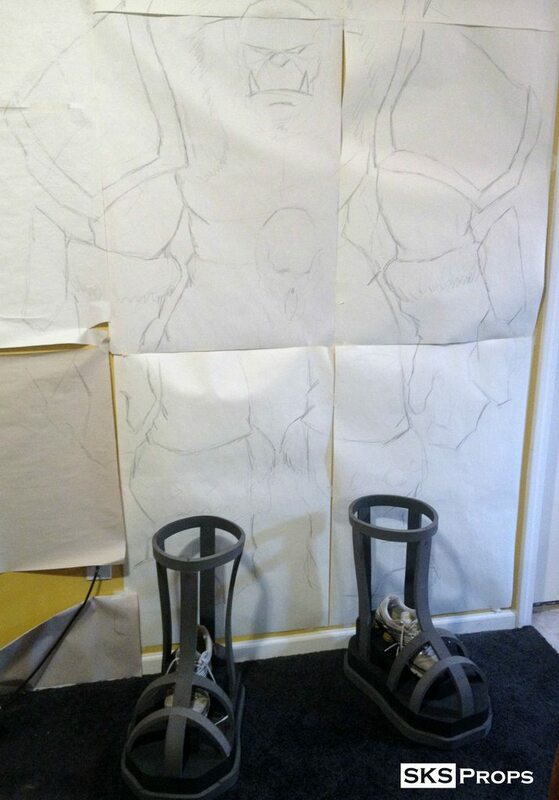 Now that I have most of my orders taken care of I have found some time to show how I made the boot structure. 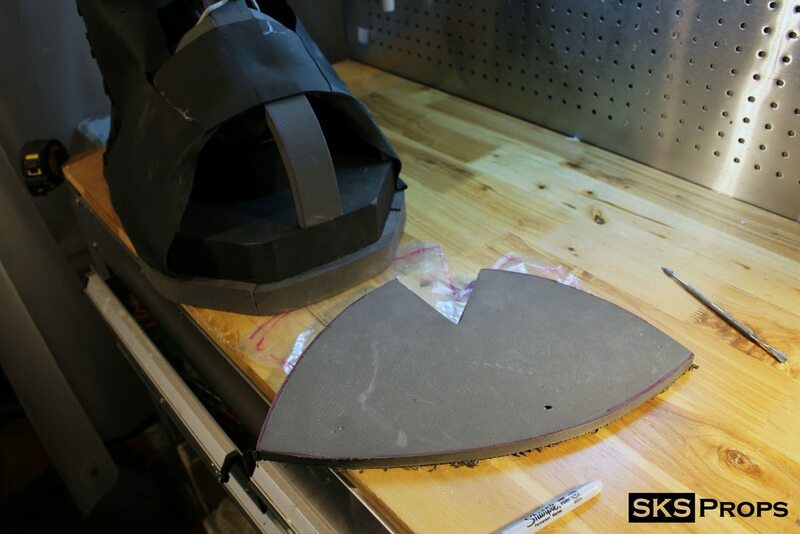 Like all off my other foam builds everything here is freehand so I don't have files for anyone to download. 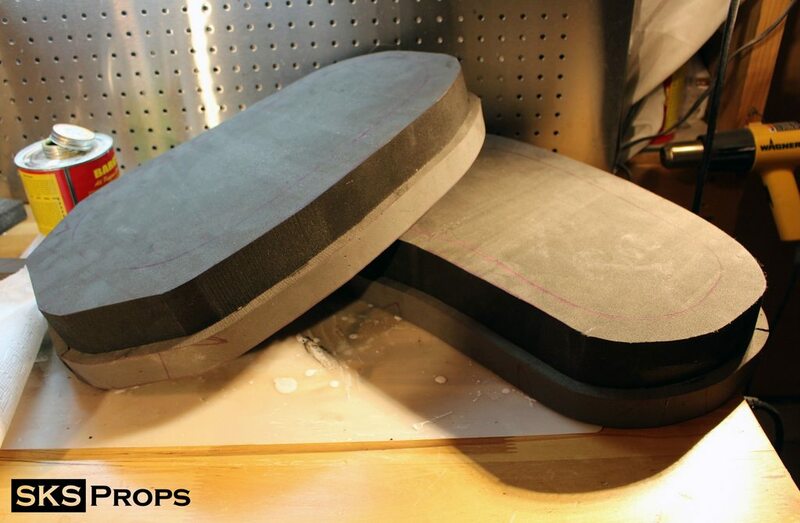 The main part of the boot is cut out on my band-saw from a of 3" thick block of foam. Like I had mentioned before there is a foam supplier here in Kansas City that sells these awesome scraps to cosplayers for dirt cheap. I rimmed the bottom of the block with 1/2" eva from Harbor Freight. 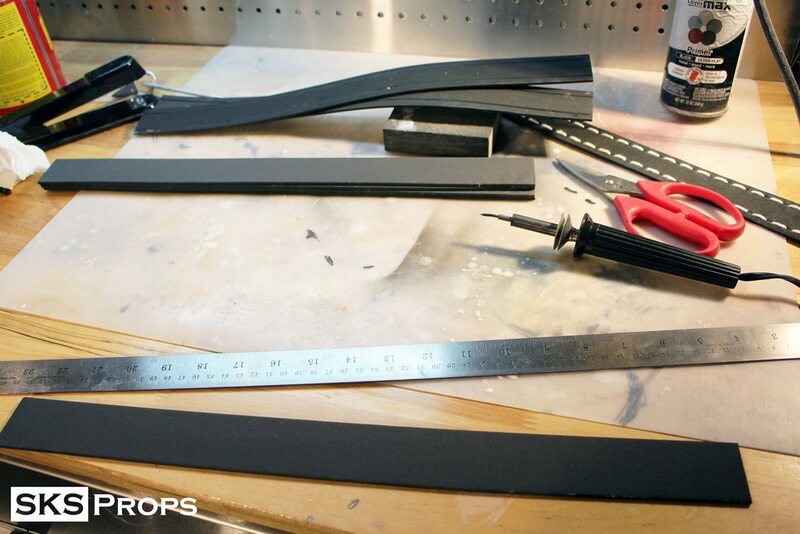 This will give me a pretty good shelf for the fake leather to take hold. 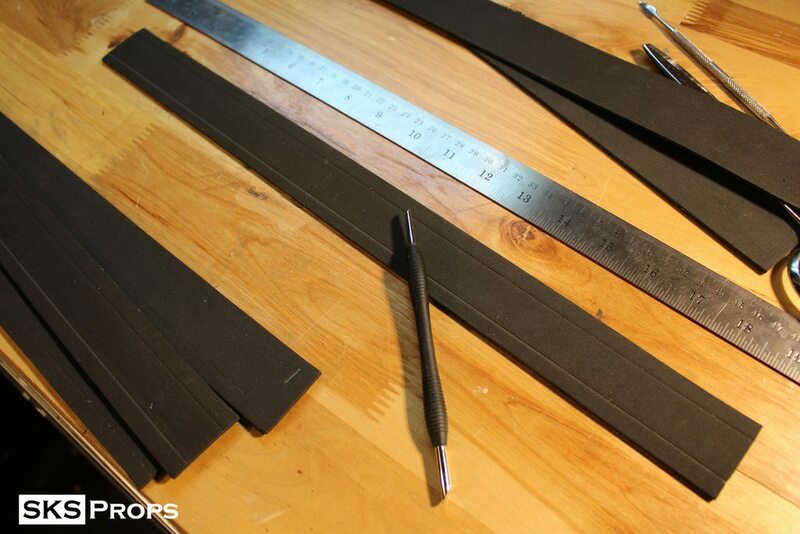 Using more of the 3" block I cut out a pair of heels that my shoes will be attached to. 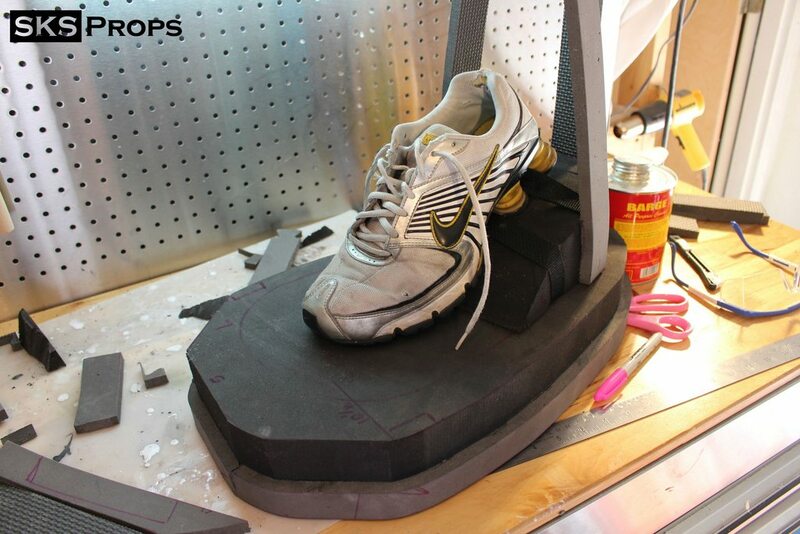 With the blocks, my shoes, plus the additional sole I will add this will give me a lift of about 10" so far . I used a pair of old Nike shocks because I could secure the straps through the shocks and glue the whole shoe down with Barge cement. 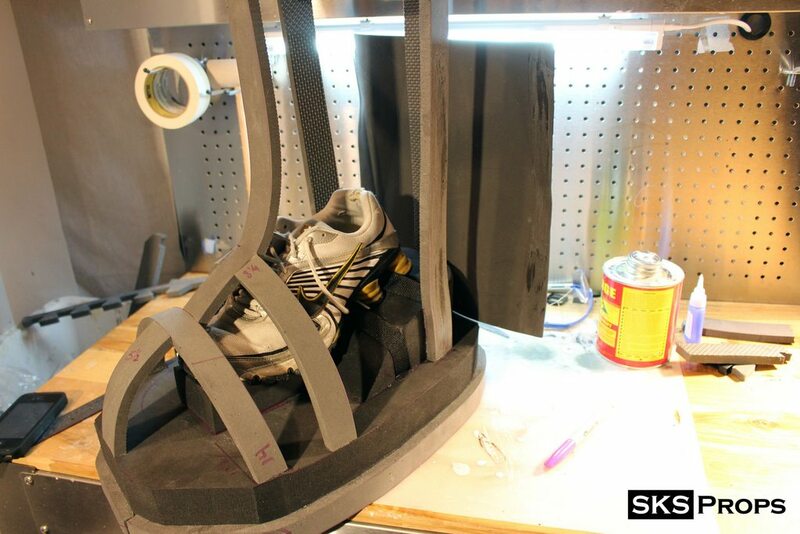 By gluing in my Nikes the fit is great and really comfortable. 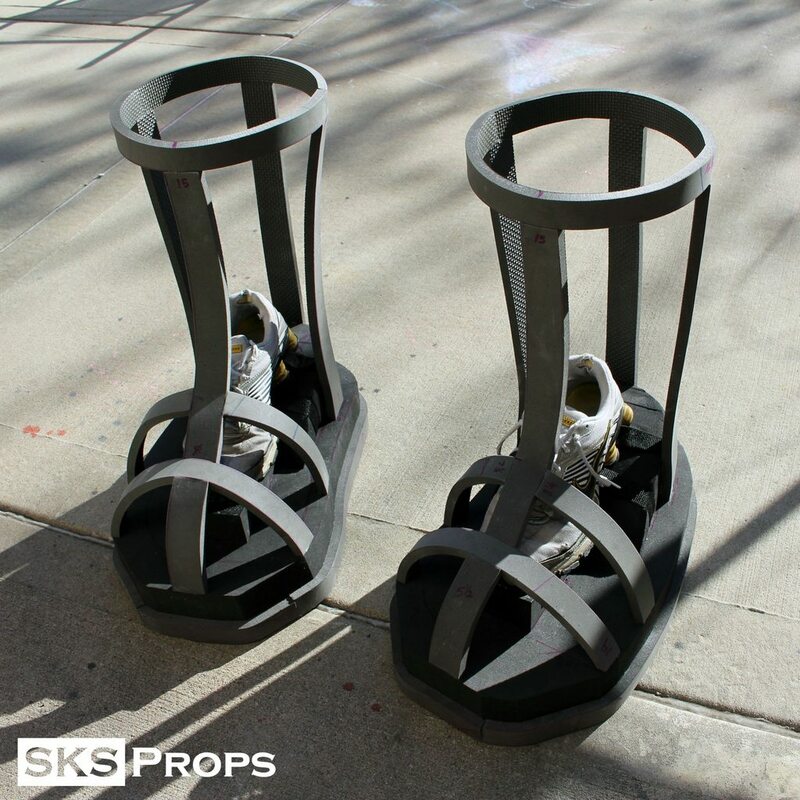 So many of the builds I looked at regarding stilts or risers using wood complained about the weight and lack of comfort. 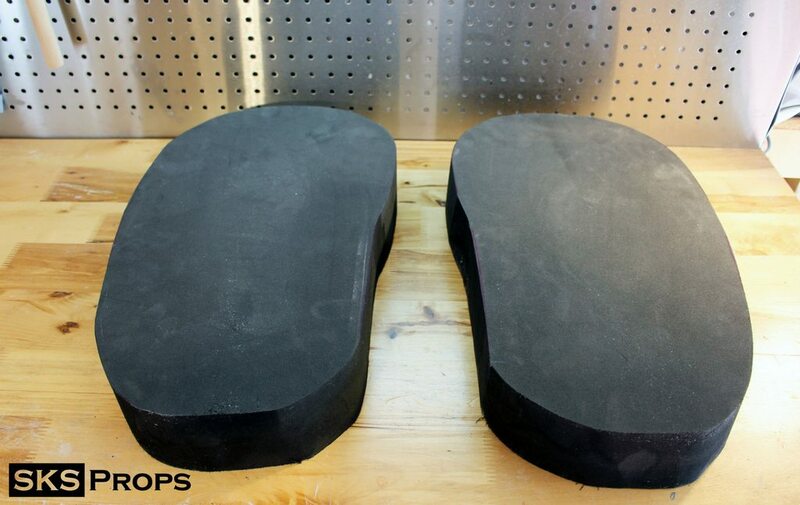 By using all foam the boots weight is minimal and they are extremely comfortable. Burnfactor, Zwilliamo and Boyea like this. Looking awesome! 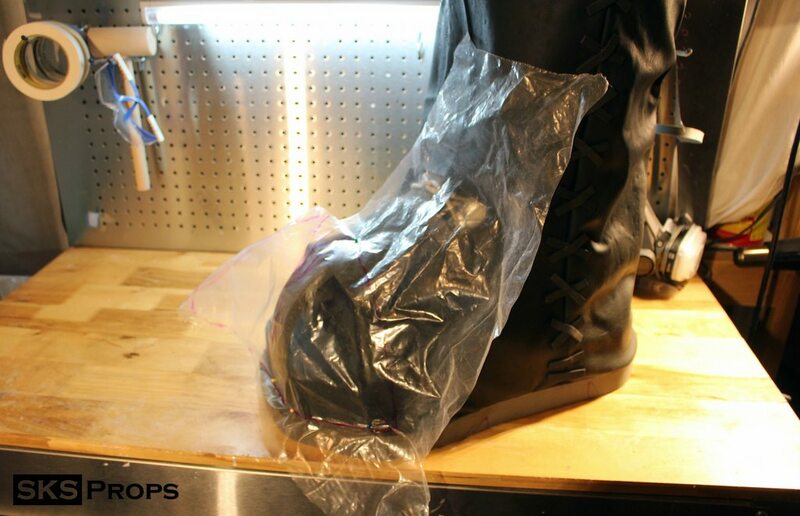 Saw you on Prop: Live, was super impressed when you held up the boot (it's massive!!). Can't wait to see more! 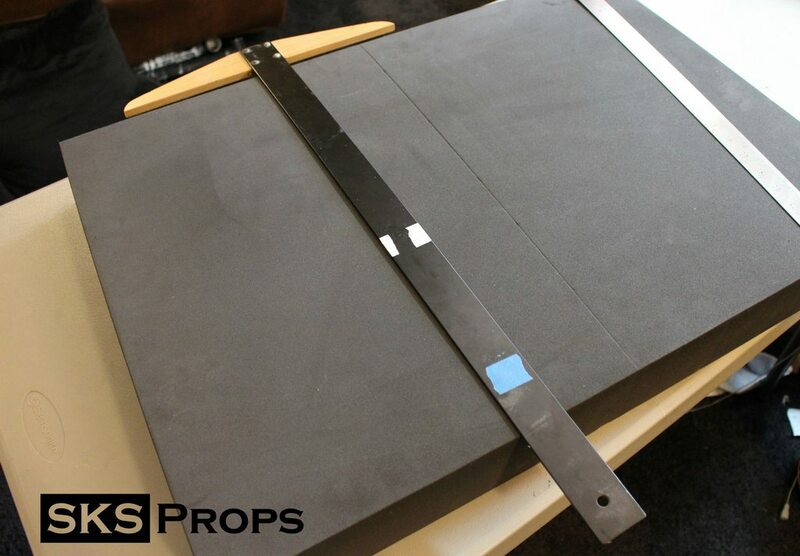 2ndNatureFX and SKS Props like this. I love to see people do Warcraft orcs! Subscribed and looking forward to this build. Definitely subbing to follow this! Awesome! I'm planning on doing the warsong commander orc! I don't need that much 'increase' in size for the female orcs aren't as massive. Following this with great interest! 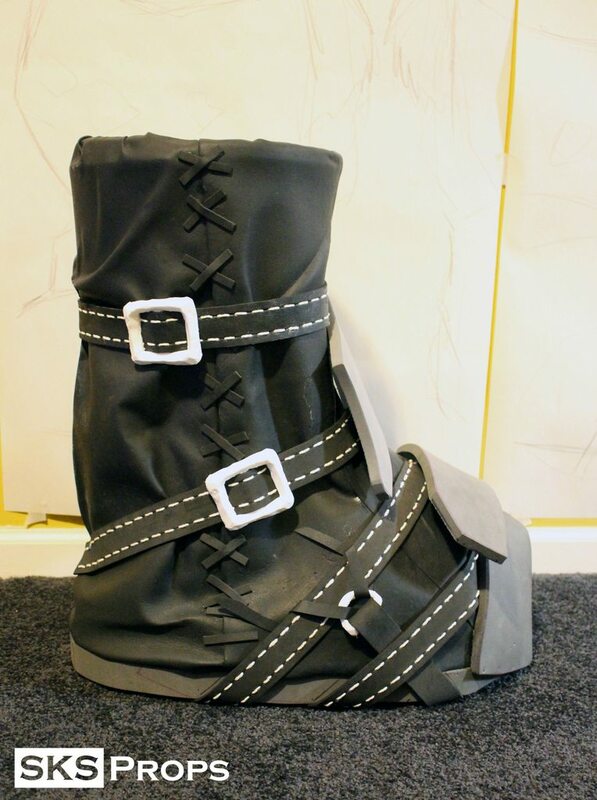 I first skinned the boots in heavy wear areas with 3mm craft foam. Then I made a template out of plastic sheeting that I had lying around and transferred the image to the discarded scrap foam. 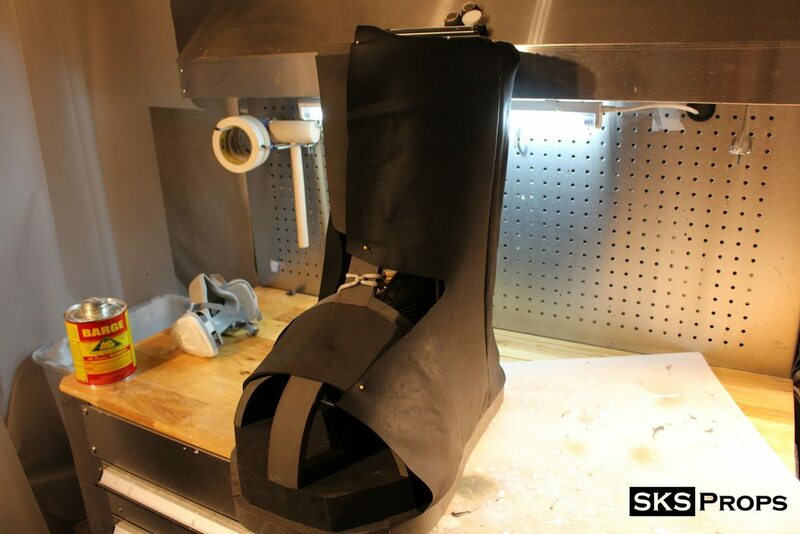 Using barge cement I started to attach the sides and back to the boot. Burnfactor and Pants like this. Prepping the boot to be skinned I forgot to mention that I reinforced areas on the underside with muslin to keep it from tearing. 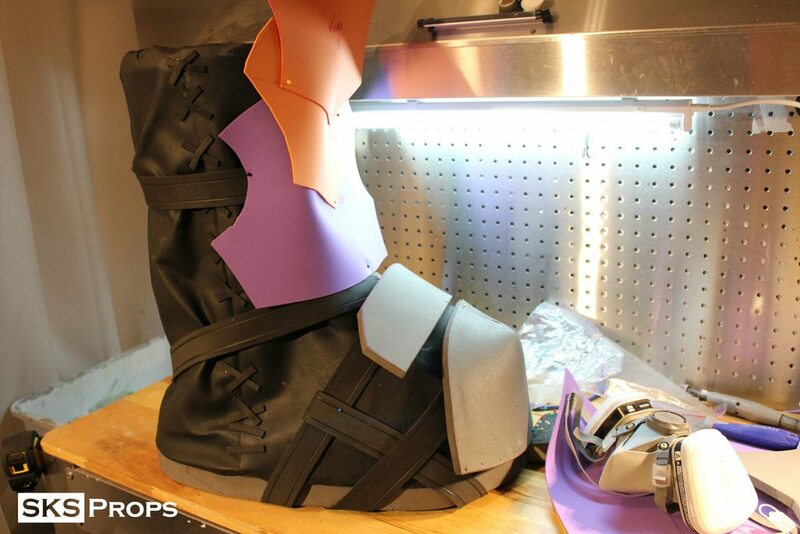 Like the upper section I patterned the toe guard armor with plastic sheeting and cut it out of 1/2" eva. 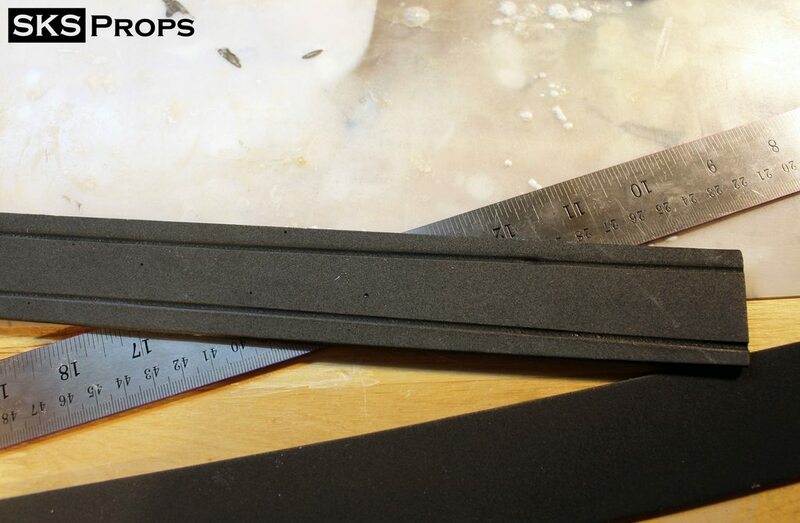 All of the other boot armor is being mocked up with cheap 1mm craft foam. 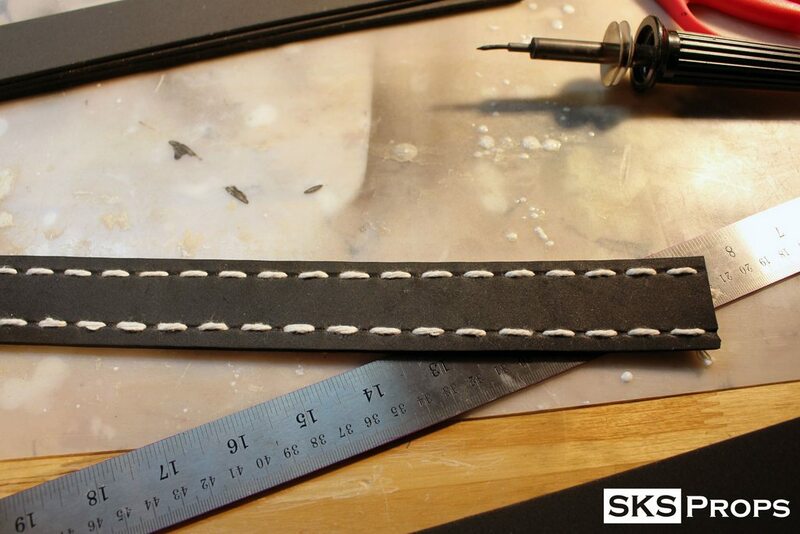 Straps are cut out of 3mm craft foam and scored using Tandy Leathers leather working tools. Because this is an all freehand custom build I couldn't just go out and buy buckles and rivets. So I took the extra step and sculpted a bunch of bits and pieces out out of Monster Clay. Overall I really wanted a rough hand forged look. 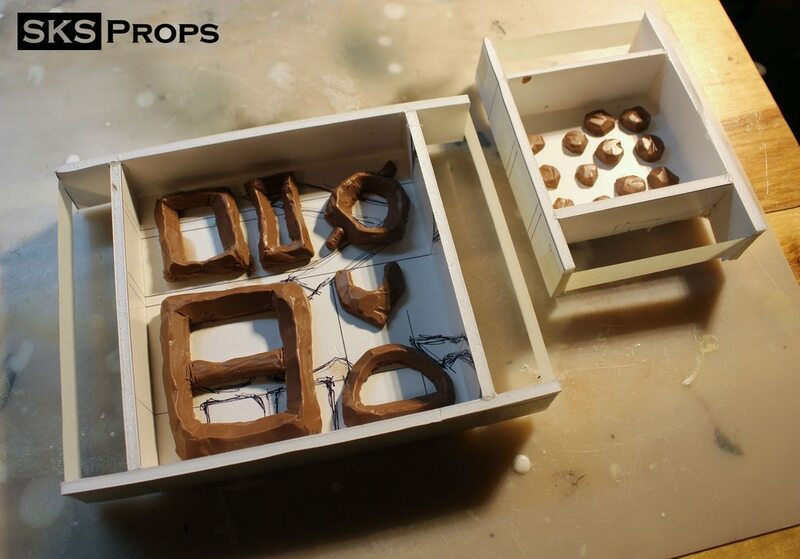 I made box molds out of foam core and used Smooth-On's oomoo silicone. I personally hate this stuff but I had some trial kits left over that needed to be used before they went bad. Burnfactor, Zwilliamo, Boyea and 2 others like this. 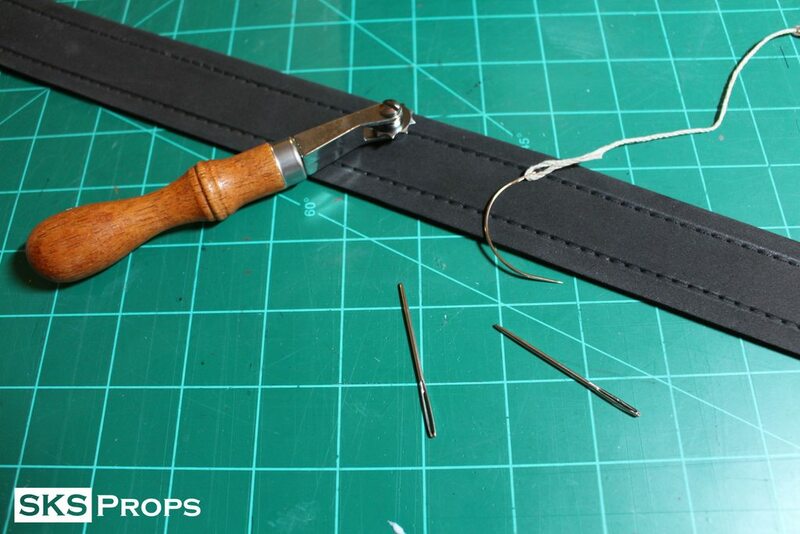 For my Warcraft Orc I decided to sew a single stitch on the straps rather than a saddle stitch. 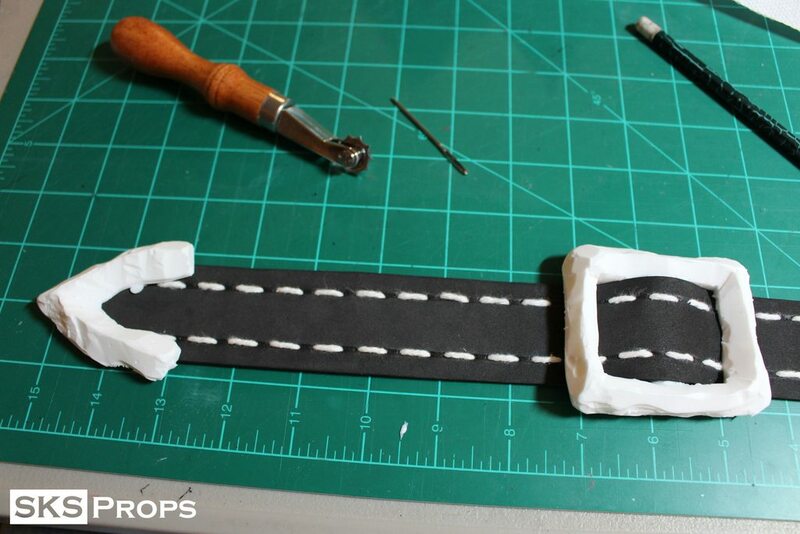 From a distance I think they individual stitches will show up better since there will be straps all over this build. 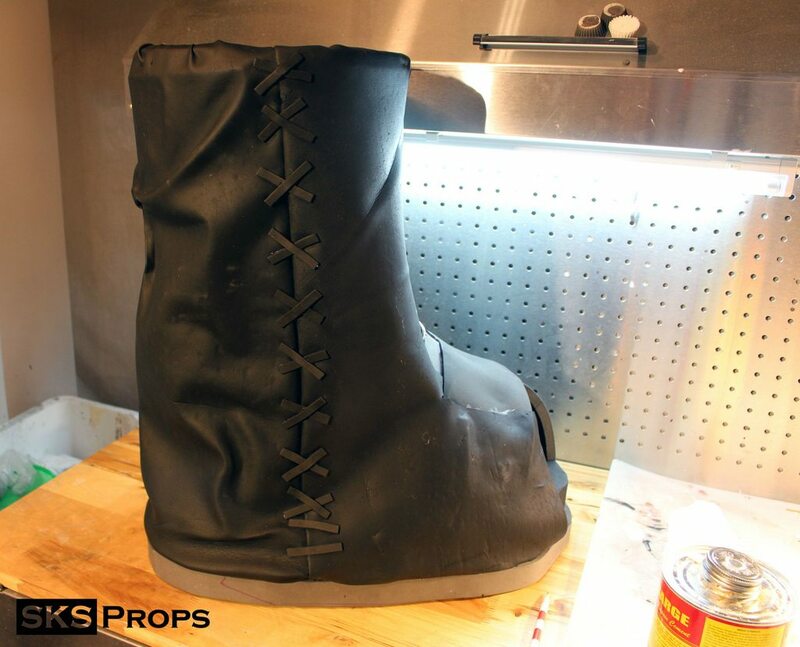 Individually cut pieces of craft foam were cut and placed on the boots to look like large stitches this will keep with the stylized over the top feel of Warcraft characters. Burnfactor, n0regret5 and Boyea like this. Warcraft Orc Glove Teaser pic - I know I'm not to the gloves yet in the build log but I am just so * happy with how they are coming out I had to put out a teaser pic. 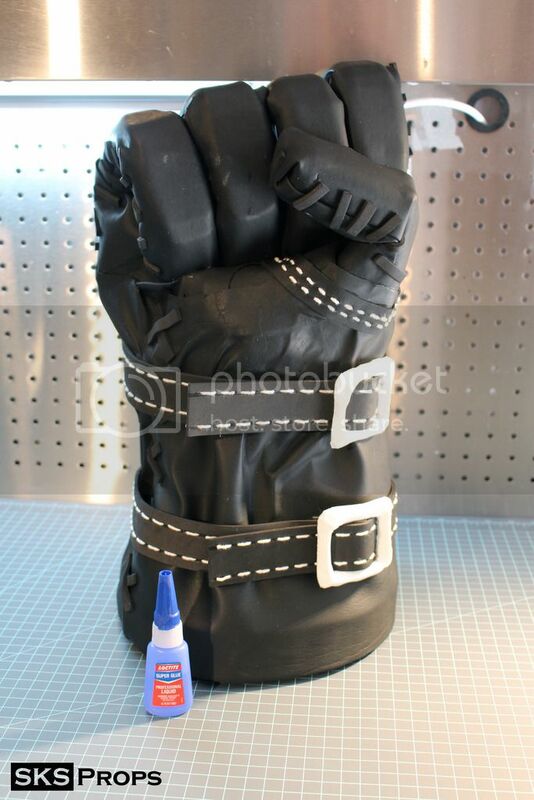 This glove is entirely made out of foam and even with the fist clenched it's still 19" tall (Loctite bottle for scale) This hand will eventually be grasping a weapon. Burnfactor, Jeebs 23, n0regret5 and 3 others like this.